After a solid workout, usually I let my endorphins take me through the day! However, sometimes because of my weird work schedule, I need a little boost. On days like these, I like to have my matcha and beet latte. Matcha green tea gives me the perfect amount of energy and is packed with antioxidants. 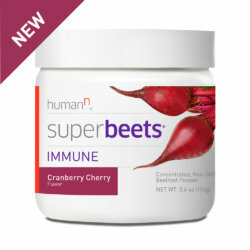 I started incorporating HumanN SuperBeets beet powder into my morning latte for extra support with my training. Beets help support natural energy, stamina, endurance, and heart health, which also makes it perfect to BEET any jet lag!